The modernization of the Strand, but more particularly the erection of the New Law Courts from Temple Bar to Clement's Inn, has destroyed very many book-hunting and literary localities. This project involved the obliteration of thirty-three streets, lanes and courts, and the levelling of 400 dwelling, lodging and ware houses, and so forth, sheltering over 4,000 individuals. It has entirely altered the aspect of the place; not perhaps before it was necessary, for the whole neighbourhood had degenerated into rookeries of the vilest description. 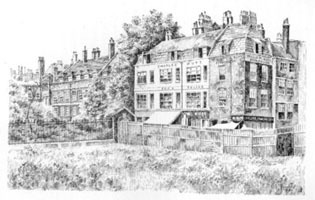 Among the localities swept away, a brief reference may be made to one which has a twofold interest—Butcher Row—first, because Clifton's Eating-house, one of Dr. Johnson's favourite resorts, was in this Row, and secondly because one of the earliest catalogues of second-hand books was issued from within a yard or two of Clifton's. J. Stephens' shop was at the sign of the Bible in Butcher Row, and towards the latter part of 1742 he published 'a catalogue of several libraries of books lately purchased, in several languages,' etc., the price of each book being, as usual, marked on the first leaf before the sale commenced, which sale was announced to begin 'on Tuesday, the 2nd of November, 1742,' and 'to continue till all are sold.' For a copy of this exceedingly rare and interesting catalogue we are indebted to Mr. Dobell, the bookseller. It comprises twenty-six pages octavo, and enumerates over 1,300 books, the majority of which are priced. There are very few volumes in this list which are now included in anyone's desiderata, but the list itself is a very good indication of the book-buying tastes of our forbears of a century and half ago. Butcher Row, it may be mentioned, was immediately beyond St. Clement's Church (on the northern side of the Strand), and by the end of the last century had degenerated into a number of wretched fabrics and narrow passages, the houses greatly overhanging their foundations; in or about 1802, this street was pulled down and gave place to Pickett Street, so named because the improvement was the scheme of Alderman Pickett. One of the last bookselling haunts to be pulled down was the quaint old shop occupied by the late Charles Hutt (who, by the way, was born in the vestry of the Clare Market chapel-of-ease) where many famous book-hunters had picked up bargains. Charles Hutt, had he lived, would have become one of the leading booksellers of the day. He was for some years at Hodgson's, and possessed a remarkable taste for, and knowledge of, books. He left Hodgson's and started on his own account in the old ramshackle house already referred to. This shop presented so unfavourable an exterior that even the Income-tax Fiend never 'called in,' although at one time there were several thousands of pounds' worth of books in it. Hutt did a very extensive trade, not only in this country, but in America. He had an especial aptitude at completing sets of particular authors—Landor, Leigh Hunt, Byron, Shelley—and contributed much to the prevailing taste for modern first editions. A younger brother, Mr. F. H. Hutt, has been for some years established at 10, Clement's Inn Passage, within a few yards of the old shop. The associations of the past half-century of this neighbourhood include two other well-known firms of booksellers. Theophilus Noble, who had removed from 114, Chancery Lane, was at 79, Fleet Street for some years until his death in 1851, and a member of the same family is still a second-hand bookseller opposite St. Mary-le-Strand Church. Reeves and Turner removed from Noble's old house in Chancery Lane, to the house on the west side of Temple Bar and adjoining it on the north, erected on the site of the famous old bulk-shop, the last of its race, where at one time Crockford, 'Shell-fishmonger and gambler,' lived. When Temple Bar was removed, this shop came down, and Reeves and Turner (who for the second time had to bow to the necessities of 'improvements') opened their well-known place on the south side of the Strand, facing St. Clement's Church. Their spacious shop here for about a quarter of a century was a famous book-haunt, and one of the very few successful ones which have existed in a crowded thoroughfare. It always contained an immense variety of good and useful books, priced at exceedingly moderate amounts, and the poorer book-lover could always venture, generally successfully, on suggesting a small reduction in the prices marked without being trampled in the dust as a thief and a robber. A year or two ago, when the lease of the shop expired, Messrs. Reeves and Turner bibliopolically ceased to exist—there not being a Reeves or a Turner in the Chancery Lane firm of booksellers of that name—but Mr. David Reeves, a son of Mr. William Reeves, started in Wellington Street, Strand, the latter, the doyen of London booksellers, occupying a portion of the house as a publisher and a dealer in remainders. More rare and interesting books have been picked up in this street during the past forty years than in any other locality. Rumour, which sometimes tells the truth, says that Shelley's copy, with his autograph on the title-page, of Ossian's 'Poems' was picked up here for a few pence. A book with Shakespeare's autograph on the title-page was also said to have been rescued from among a lot of cheap books in this locality a few years ago. We are not certain, but we believe that the Shakespeare autograph has been proved to be a forgery. If that is so, then perhaps the honour of being the greatest 'find' ever discovered, about four years ago, in Holywell Street, pertains to a perfect copy of 'Le Pastissier François,' 1655, the most valuable of all the Elzevirs, its value being from about £60 to £100. The copy in question was bound up with a worthless tract, and history has not left on record what the bookseller thought when he discovered his ignorance. A copy of the first edition of Horne's 'Orion,' 1843, was purchased in this street for 2d. in 1886, its market value being about £2. It was originally issued at 1/4d., by way of sarcasm on the low estimation of epic poetry. The Holywell Street bookseller did not appraise it at a much higher figure than the author. Scarcely a week passes without a volume possessing great personal or historic interest being 'bagged' in this narrow but delightful thoroughfare. Many of these finds, it is true, may not be of great commercial value, but they are oftentimes very desirable books in more respects than one. The present writer has been fortunate in this matter. No person would now rank James Boswell, for instance, among great men, but a book in two volumes, with the following inscription, 'James Boswell, From the Translator near Padua, 1765,' would not be reckoned costly at 1s., the book in question being a beautiful copy of Cesarotti's translation into Italian of Ossian's 'Poems.' David Hume's own copy of 'Histoire du Gouvernement de Venise,' par le Sieur Amelot de la Houssaie, 1677, was not dear at 6d., and at a similar price was obtained an excessively rare volume (for which a well-known book-collector had been on the look-out in vain for many years), whose contents are little indicated by the title of 'Roman Tablets,' 1826, but whose nature is at all events suggested by the sub-title of 'Facts, Anecdotes, and Observations on the Manners, Customs, Ceremonies and Government of Rome.' It is a terrific exposure (originally written in French), for which the author was prosecuted at the solicitation of the Pope's Nuncio at Paris. The late John Payne Collier has told of a Holywell Street 'find' as far back as January 20, 1823, when he picked up a very nice clean copy of Hughes' 'Calypso and Telemachus,' 1712, for which he paid 2s. 6d. It was not, however, until he reached home that he discovered the remarkable nature of his purchase, which had belonged to Pope, who had inscribed in his own autograph thirty-eight couplets, addressed 'To Mr. Hughes, On His Opera.' These are only a selection from an extensive series of more or less interesting 'finds,' of which every collector has a store. Two of the earliest and best-known of the more important Holywell Street booksellers passed away some years ago. 'Tommy' Arthur, who made a respectable fortune out of the trade, and whose shop and connections are now in the possession of W. Ridler, who is a successful trader, and a man of considerable independence as regards the conventionalities of appearances. (Our artist's portrait of this celebrity in his brougham, indulging in the extravagance of a clay pipe, had not arrived at the time of going to press, so it must be held over until the next edition of this book.) Joseph Poole was another Holywell Street bookseller of an original type, with his quaint semi-clerical attire. This bibliopole's relatives still carry on business in this street, school-books being with them a speciality. The doyen of the street is Mr. Henry R. Hill, whose two shops are at the extreme east end of the street. Mr. Hill has been here for about forty years, and has seen many changes, not only in the general character of the street, but also of the tastes in book-fancies. Mr. Hill's shops, with Mrs. Lazarus's three hard by, are full of interesting books, priced at very moderate figures. The latter has been established here for about fifteen years. Messrs. Myers, who also occupy three bookshops in this street, were for some years with Mrs. Lazarus; and Mr. W. R. Hill acquired a great deal of his book-knowledge at Reeves and Turner's. Mr. Charles Hindley has been long established in this street. The step from fifth-rate book-making to second-hand bookselling is not a great one, and just as Holywell Street sheltered the Grub-writers of half a century ago, so Drury Lane and its immediate vicinity was their recognised locality in the earlier part of the last century. It is impossible to associate respectability, to say nothing of fashion, with this evil-smelling, squalid thoroughfare. And yet there can be no question about its having been at one time an aristocratic quarter. Until within the last few years, the Lane itself, and its numerous tributaries, contained many second-hand bookshops. The most celebrated, and, indeed, almost the only one of any interest, was Andrew Jackson, who made a speciality of old and black-letter books. Nichols tells us that for more than forty years he kept a shop in Clare Market, and here, 'like another Magliabecchi midst dust and cobwebs, he indulged his appetite for reading; legends and romances, history and poetry, were indiscriminately his favourite pursuits.' In 1740 he published the first book of 'Paradise Lost' in rhyme, and ten years afterwards a number of modernizations from Chaucer. The contents of his catalogues of the years 1756, 1757, 1759, and one without date, were in rhyme. He retired in 1777, and died in July, 1778, in the eighty-fourth year of his age. Charles Marsh, another literary bookseller, was for some time a friend and neighbour of Jackson's. Marsh (who afterwards removed to a shop now swallowed by the improvements in Northumberland Avenue, Charing Cross) was situated at Cicero's Head, in New Round Court, off the Strand, and is described by one who knew him as being afflicted with 'a very unhappy temper, and withal very proud and insolent, with a plentiful share of conceit.' He wrote a poem entitled 'The Library, an Epistle from a Bookseller to a Gentleman, his Customer; desiring him to discharge his bill,' 1766. He was originally a church-clerk. The only catalogue of this celebrity which we have seen is a bulky one, over 100 pages octavo, enumerating 3,000 books, 'among which are included the libraries of the Rev. Mr. Gilbert Burnet, Minister of Clerkenwell, and an eminent apothecary, both lately deceased.' The date is May 7, 1747. Some of the prices in this catalogue can only be described as absurd; for example, Lydgate's 'Bochas; or, The Fall of Princes,' 1517, 5s. ; a collection of old plays and poems, two volumes, 1592, 6s. ; Tusser's 'Five Hundred Points of Good Husbandry,' 1574, 2s. 6d. ; and black-letter books by the score are here offered at sums from one to three or four shillings each. The neighbourhood has for many years ceased to be a bookselling locality, for although book-hunters prefer side-streets and quiet thoroughfares for the prosecution of their hobby, the pestiferous vapours of Drury Lane would kill any bibliopolic growth more vigorous than a newsvendor's shop. When, by slow degrees, the various trades moved in a direction west of Temple Bar, it was only natural that the trade in second-hand books should be similarly attracted. The Strand itself, which, at the end of the last century and beginning of the present, was a much narrower street than it is now, is not, and never has been, a great book-emporium, for a reason which we have more than once pointed out. But the immediate vicinity has been for over a century and a half, as it still continues to be, the favourite locality of some of the chief booksellers. To-day the Strand proper only contains three representatives, in Messrs. H. Sotheran and Co., the finer of whose two shops is in Piccadilly, and Mr. David Nutt (both of whom are, however, vendors of new books, and often act as publishers), and Messrs. Walford. Within a stone's-throw of the main thoroughfare we have John Galwey and Suckling and Galloway, Garrick Street; James Gunn and Nattali, Bedford Street; B. F. Stevens, Trafalgar Square; H. Fawcett, King Street; W. Wesley and Sons, Essex Street; and many others. One of the most interesting incidents in connection with the Strand relates to a house which stood between Arundel and Norfolk Streets, where, at the end of the seventeenth century, lived the father of Bishop Burnet. 'This house,' says Dr. Hughson, writing in 1810, 'continued in the Burnet family till within living memory, being possessed by a bookseller of the same name—a collateral descendant of the Bishop.' Of much more importance, however, is the fact that at 132, Strand a bookseller named Wright started, about 1730, the first circulating library in London. About ten years afterwards he was succeeded by William Bathoe ('a very intelligent bookseller' who died in October, 1768), who carried on the circulating library in addition to bookselling. Bathoe was a book-auctioneer as well as a retail vendor; he sold the books of 'William Hogarth, Esq., sergeant-painter,' under the hammer. In or about the year 1747 he had established himself 'in Church Lane, near St. Martin's Church in the Strand, almost opposite York Buildings,' whence he issued a thirty-eight-paged (octavo) catalogue, comprising the 'valuable library of the learned James Thompson Esq., deceased, with the collection of a gentleman lately gone abroad'; this list enumerates nearly 1,000 items, the prices, ranging from 6d. upwards, being uniformly low. Walton's 'Compleat Angler,' 1661, 'with neat cuts,' would not be long unsold at 3s. 6d. ; and the same may be said of Purchas's 'Pilgrimage,' 1617, 2s. 6d. ; of Rochester's complete poems at 2s. ; and very many others. At 'No. 18 in the Strand' lived J. Mathews, the bookseller, and father of Charles Mathews, the actor; and in this house the latter was born. Jacob Tonson was at 'Shakespeare's Head, over against Catherine Street, in the Strand,' now 141; the house, since rebuilt, was afterwards occupied by Andrew Millar, who deposed Shakespeare, and erected Buchanan's Head instead. Millar was succeeded by his friend and apprentice, Thomas Cadell (who became a partner in 1765), in 1767; he retired in 1793. Cadell's son then became head of the concern, and took William Davies into partnership. The firm of Cadell and Davies existed until the death of the latter in 1820, after which Cadell (the Opulent Bookseller of Beloe) continued it in his own name until his death in 1836. Samuel Bagster; Whitmore and Fenn; J. Walter (an apprentice of Robert Dodsley, and the founder of the Times); William Brown (an apprentice of Sandby), Essex Street, who died in 1797, and who was succeeded by Robert Bickerstaff; Henry Chapman, Chandos Street, 1790-1795; W. Lowndes; and Walter Wilson, of the Mews Gate, were Strand booksellers of more or less note during the latter part of the last, and the earlier part of the present, century.